In the Cinemalaya entry Posas, Nico Antonio (left photo) plays a cell phone snatcher who is captured and tortured by policemen. In right photo, the actor-singer demonstrates how to steal a cell phone while his co-star, Bangs Garcia, pretends to be his victim. Nico Antonio actually felt the sensation of drowning when he was tortured for real in the Cinemalaya entry, Posas. The singer-actor is cast as a cell phone snatcher who is captured and tortured by policemen. He and his co-stars shot their scenes on the streets of Quiapo as well as in a police station. Nico endured waterboarding, a form of torture wherein water is repeatedly poured over a person’s face, which causes him to experience the sensation of drowning. During the July 6 press conference for Posas held at Annabel’s Restaurant on Tomas Morato, Nico described how they shot his torture scene. “May busal sa bibig ko, then may panyo sa mukha ko, then binuhusan [ako] ng tabo ng tubig. "Ang paraan lang para makahinga ako ay through the nose... dahil yung busal na tuwalyita nasa bibig ko, wala nang air na makaka-seep dun. “Nung binubuhusan ako ng tubig, hindi ako makahinga! Pakiramdam ko, nasa dagat ako. Naka posas ako nun at si Jake [Macapagal], nakadagan sa dibdib ko. According to Nico, his co-actor, Nor Domingo, who plays one of the cops who tortured him, wanted to cut the scene short because it was too realistic. Did Nico develop a phobia for water because of this scene? Atty. Joji Alonso, Nico’s mom and co-producer of Posas, said it was a good thing that she did not know that they would torture her son for real. “When they were doing this movie, hindi ko naman alam na tototohanin nila. Buti na lang hindi ko alam,” she said with a smile. “They were doing a torture scene for the film and dapat kasi ife-fake yun. Nakakatawa raw tingnan nung sinubukan nila. So they decided to do it for real. Aside from this torture scene, Nico also took lessons from a former snatcher on how to steal wallets and cell phones. During the presscon, Nico demonstrated how to steal a cell phone from a bag carried by his leading lady, Bangs Garcia. Directed by Lawrence Fajardo, the film will compete in the Director’s Showcase category of the 2012 Cinemalaya. Posas was supposed to be directed by Jeffrey Jeturian but he had to back out because of his directorial duties for the ABS-CBN teleserye, Mundo Man ay Magunaw. Atty. Joji narrated, “Kapipirma lang namin noon ng kontrata with ABS-CBN and... we were asking for a leave of absence because we were rushing [Posas] for Cannes [Film Festival in France]. Hindi talaga pwede because he [Jeffrey] was just starting on his new soap. “Sabi ng isang executive ng ABS-CBN, kaka-start lang niya [Direk Jeffrey], ipapaleave mo na agad. That is why he did not do this film and we searched for the best person. "Pareho kami ng idea kung sino ang kukunin and that is Law Fajardo because we were so impressed with what he did in Amok. “So, sa mga nagsasabi na hindi ginawa ni Jeffrey ang movie dahil hindi niya gusto si Nico, [nothing could be further] from the truth. SHORTLISTED IN CANNES. During the presscon, Atty. Joji revealed that Posas almost made it to the prestigious Cannes Film Fest. It was shortlisted in the Un Certain Regard section that runs parallel to the festival’s main competition. “Posas is one of the 25 films they shortlisted for the Un Certain Regarde section,” said Atty. Joji. “It was e-mailed to me by no less than the programmer himself. For his part, Nico admitted that making the cut in Cannes would have brought great joy to his mother. INTRIGUES. 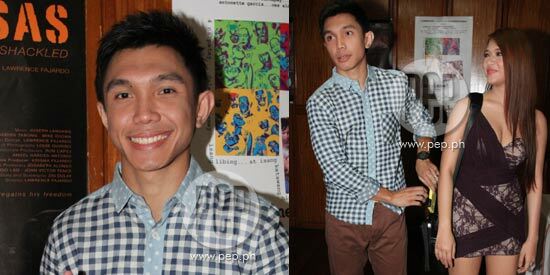 Did Nico Antonio get the lead role in Posas because he happens to be the son of the film’s producer? Atty. Joji answered matter-of-factly: “Unang-una, bilang producer, anong pakialam naman nila, e, pera ko naman ito, di ba? She then defended her son Nico by enumerating his achievements. “Ang tagal-tagal na niyang gustong gawin ito. He started in his Ateneo days when he won Best Actor. He had to shift to singing para kahit papaano mapansin siya. Atty. Joji also revealed the sacrifices that Nico did for Posas. “In this film, he was asked to lose 30 pounds. Ang hirap because this guy is not fat. It’s all muscle. So we had to get a private trainer to get him to lose weight. “Nandun yung punto na hindi siya pinapakain ng carbs [carbohydrates] at all, puro protein. Tumatawag na siya, sabi niya sa akin, ‘Ma, dalhin mo ako sa doctor kasi hindi na ako makalakad.’ Puro gout na yung paa niya dahil puro protein.